Learn how easy it is to get noticed with a good lobby sign. Want to know what makes a good lobby sign? 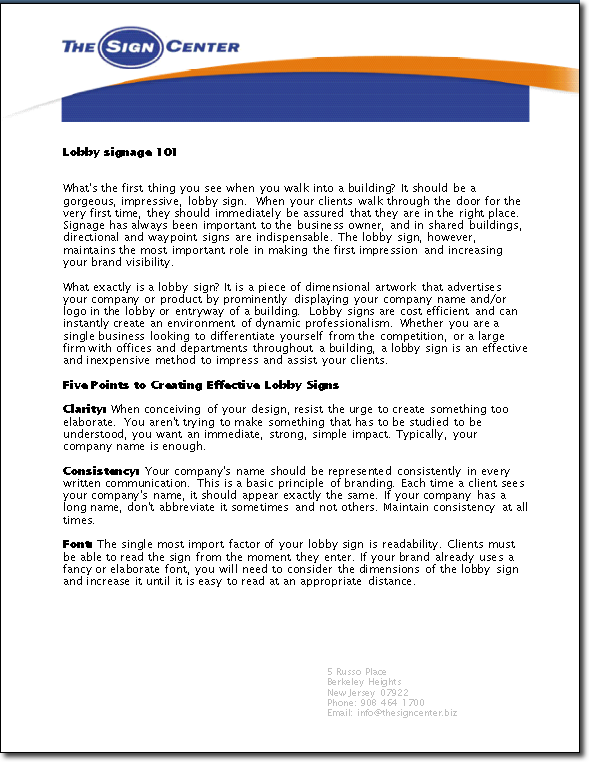 The Sign Center has put together a 3 page tip sheet on how to make sure you are getting a lobby sign. This tip sheet uses The Sign Center's knowlegle to explain how to get the best out of your lobby signs or sign company. and a few other tips that will help you create a great sign! So if you are in the market for a new lobby sign you are in luck! This tip sheet could save you a ton of money by doing the sign right the first time. So if you need some key tips to guarantee you get a good sign download this tip sheet today!